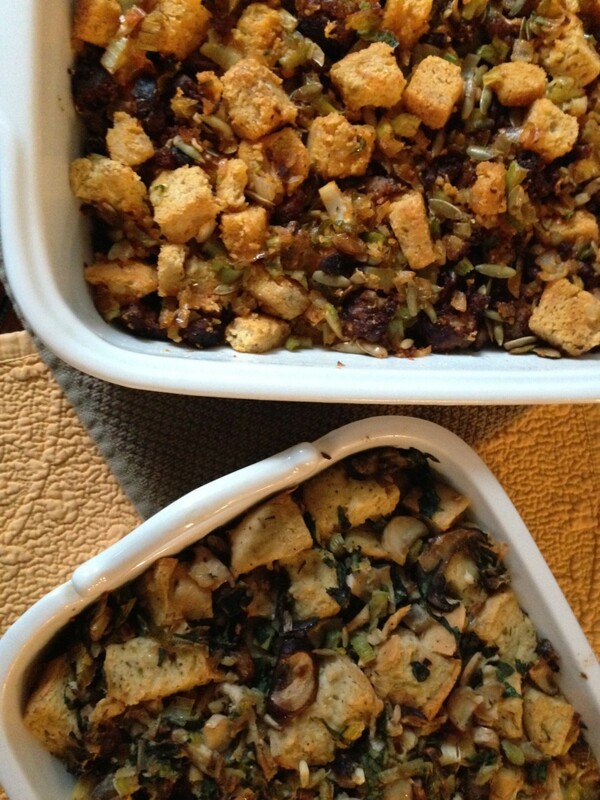 Here is the other adapted stuffing recipe from the catalog project. I had prepared, and stored in the freezer. It smelled amazing when I pulled it out of the oven. You know I had to pick on it before it cooled. So … it has a mildly spicy, and smoky flavor, that tastes so yummy with sweetness of the cornbread. OMG. And add pepitas to the mix for a twist on the traditional. Yeah, Williams Sonoma knows flavor combinations. If you don’t like seeds in your stuffing I recommend chestnuts, or dried tart cherries. The pepitas do give it a nice flavor and are not overpowered by the chorizo at all. I strongly recommend you try this. I had to nibble on some for quality control purposes, right?? Hehe. Pepitas are so healthy for you, but that doesn’t matter when it comes to Thanksgiving. What was I thinking. Forget I said that. Health is kind of on the back burner on Thanksgiving. This is simply a delicious stuffing full of flavor. Period. In case you missed it, the other stuffing recipe I made is Focaccia Stuffing with Leeks and Wild Mushrooms (see here for recipe), a vegetarian version made with eggs. I didn’t add too much jalepeno, add more if you like it more on the spicy side. 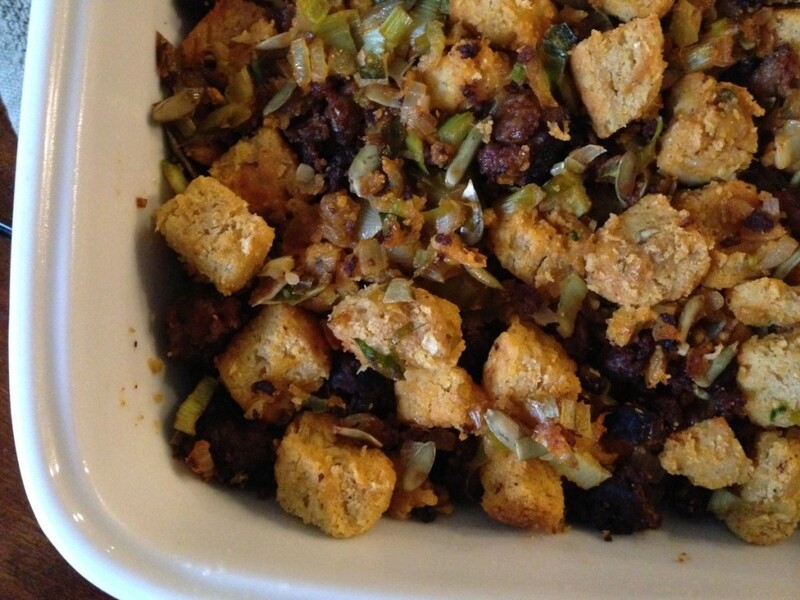 Another stuffing option for Thanksgiving … enjoy! Note: Chorizo could have gluten and/or dairy. Check ingredient labels. I buy from Whole Foods Market. Prepare the cornbread, as directed on the packaging. I used almond milk for mine. When completely cooled, then preheat oven if not making cornbread in advance. 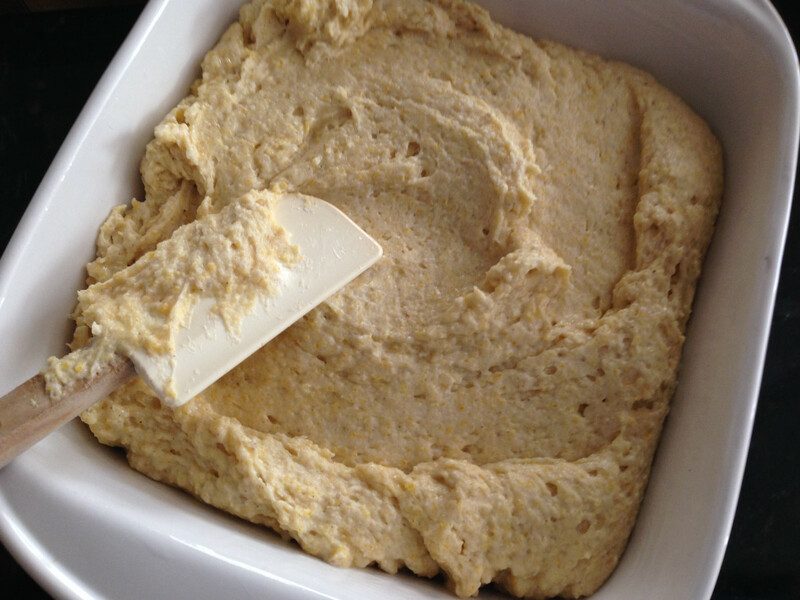 Preheat an oven to 375°F Grease a 9-by-13-inch oven safe baking dish. In a large nonstick pan over medium-high heat, add olive oil. When hot add the chorizo and cook, breaking it up into small pieces with a spatula, until browned, about 5-7 minutes. Do not discard oil and fat drippings. Transfer to a plate, and pat with a paper towel to remove excess oil. Set aside. 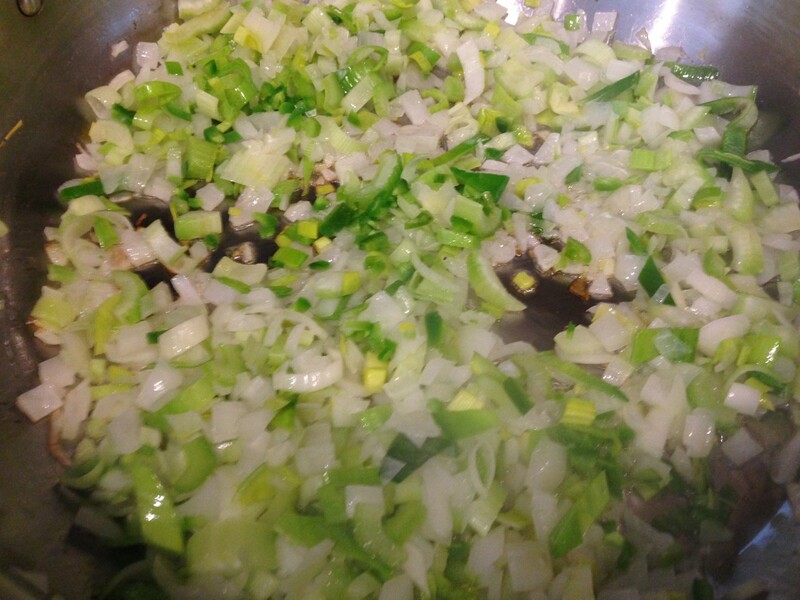 In the same pan, with the remaining oil, set over medium-high heat, add the onion, celery, jalapeño, salt and pepper and sauté until the vegetables are soft and translucent, about 5-7 minutes. Transfer the onion mixture to a large bowl, add the cooked chorizo, mix well. Add the cubed cornbread, and stir gently until well combined. Transfer to the greased baking dish. Add the stock, evenly throughout the dish, making sure to cover the cornbread cubes. Sprinkle evenly with the pepitas. 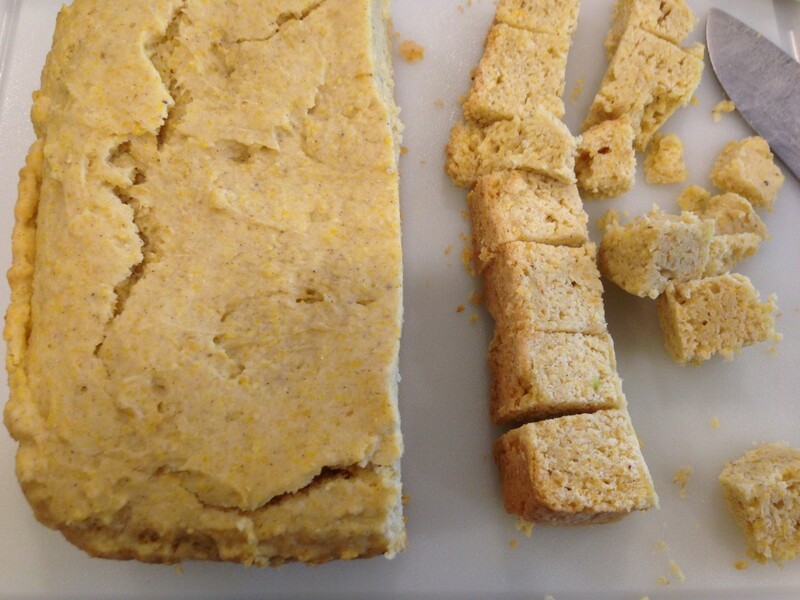 Bake for 30-40 minutes, until the cornbread has a light golden color, and the stuffing does not appear wet or mushy. Let it set for 5 minutes before serving. Note: If freezing, completely cool (about an hour) before completely wrapping (3 times) in plastic wrap, not just the top of the dish. Then put it into a jumbo 2 gallon freezer bag. If you cannot find those, wrap another 2 layers of plastic wrap. The stuffing recipe looks pretty easy. I need to check if my butcher has gluten free chorizo, if not what do you suggest? Clara, the gluten (or dairy) in chorizo is usually the casing or "flavorings" added to it. If it made by the butcher it will probably be gluten free, but yes, good to check. If not a spicy pork sausage, or spicy chicken sausage would work. Just add a teaspoon of paprika, and 1/2 teaspoon of paprika if you want to mimic the chorizo flavor. I love all the ingredients in here and think I will try this recipe this year! I don't know how they will react to pepitas, I may have to replace with something else. 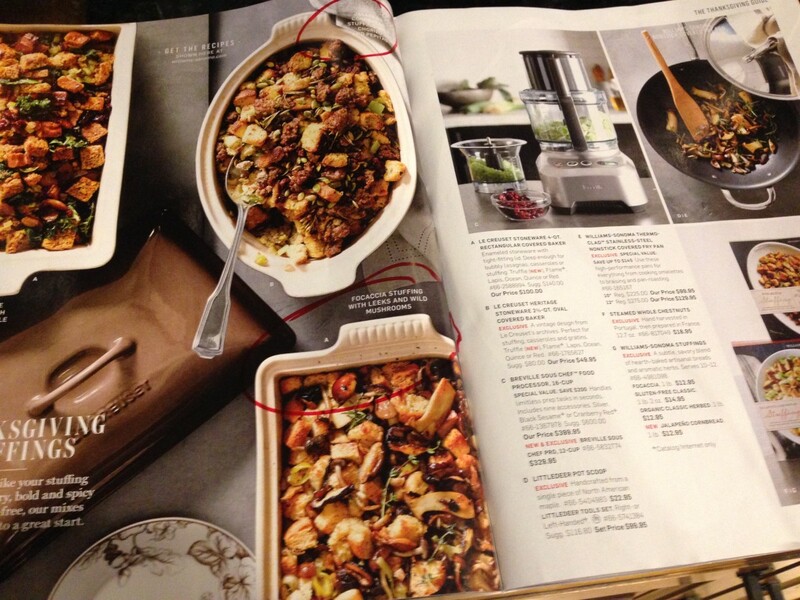 Stuffing looks so similar to the williams sonoma one, wow! was google doodling gluten free dairy free stuffing recipes and found this one and WAS NOT expecting chorizo but am obsessed now. So perfect! Depending on the flavors you are looking for, here are a few options, albeit on the not-so-traditional side...If I was to substitute I think I would use dried tart cherries (nice contract to smoky chorizo), or toasted pine nuts, or golden raisins. How does that sound? I'm planning to make this stuffing for my Thanksgiving dinner. It looks amazing! I love the fact that I can freeze it ahead of time. Anything to reduce the pressure of preparing all the dishes at once. Less pressure is always good! Enjoy! 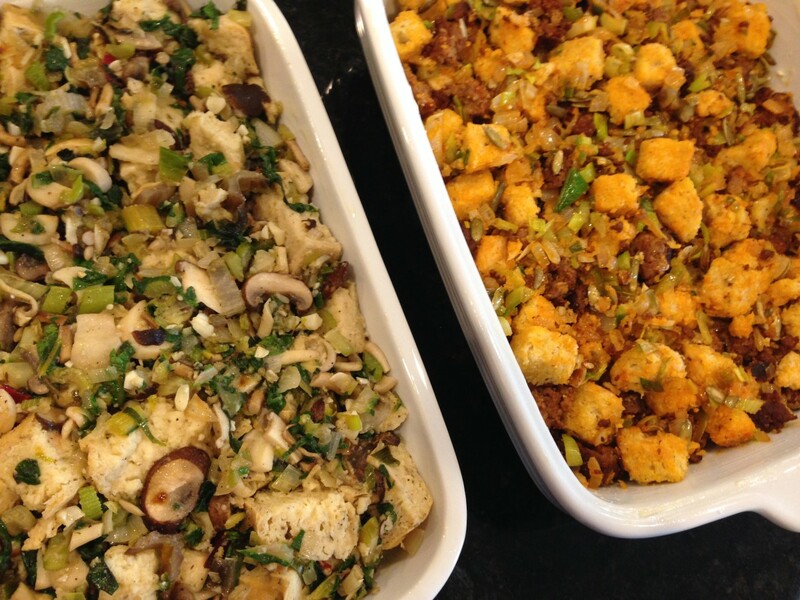 I just saw your focaccia wild mushroom stuffing and see here another stuffing recipe!!! I think I need 2 kinds of stuffing this year this looks so good! You didn't specify the milk substitute for the corn bread mix. Can I use coconut milk? I can't wait to make this dish. Any alternative milk is good. Coconut milk is great. Thanks for the comment, enjoy! emailing to my brother. This is right up his alley! Not sure what you mean by fresh chorizo? This have all the south western flavors I was looking for and want to make it but I don't know what you mean fresh chorizo? What I mean by 'fresh' is that it should be raw not cooked chorizo raw since it can get too tough with the cooking time. If that's not available you could also use cooked chorizo and it in towards the end. Hope that helps!